The month of April is synonymous with being wet from spring showers. The month also frequently hosts the holiday of Easter as well. I think I’ll just be ‘one’ with it all! I see pastels everywhere (fashion-wise) this season, and I am not one to purposefully follow trends, but the new, rayon-based, super-soft knits at my local fabric store tempted me, too much. They also happen to be a designer line! Now I can be on trend, yet still sneak in my vintage love with this dress, he he. 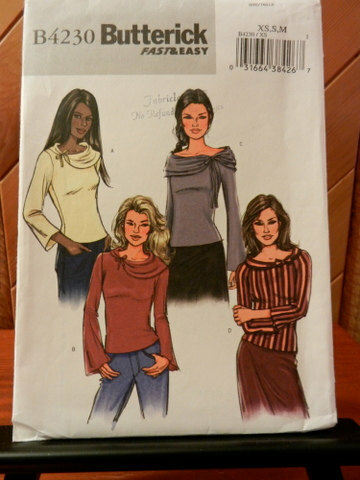 FABRIC: a Kathy Davis Designer brand knit “Eraser Purple”- 97% Rayon 3% Spandex knit. NOTIONS: nothing but thread and two small strips of interfacing were needed –simple! TIME TO COMPLETE: the dress was finished on April 1 (2016) after about 8 hours spent to make it up. TOTAL COST: This fabric was a very recent purchase from my local Jo Ann’s fabric store. I spent about $18 for two yards…a bit more than what I’m used to spending but worth it for a designer printed dress like this one! 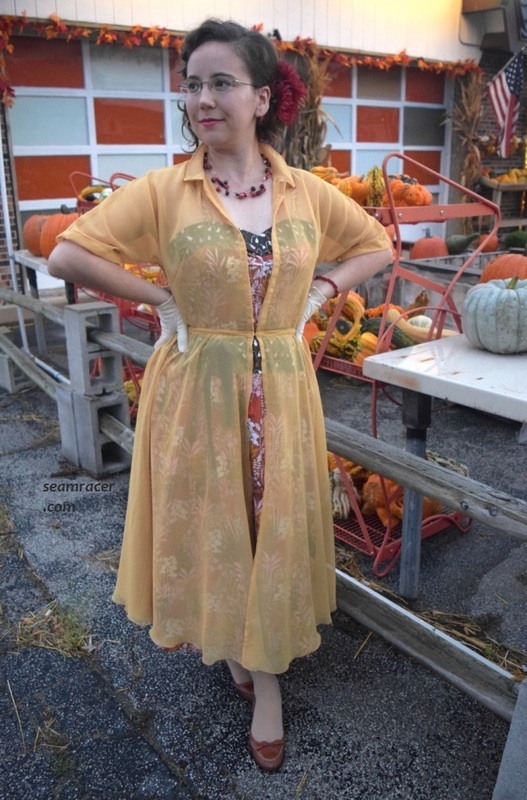 This garment is part of two sewing challenges actually – the “Wardrobe Builder” dress project for April as well as the “Easter-Spring Dress” sew-a-long. It is part of the “Wardrobe Builder” project because firstly, it is a dress, plus being one that is so very practical yet dressy at the same time. This combo should make this a nice go-to for early spring, especially since it has long sleeves to keep me warm enough through the chilliness we so frequently have through the season. My dress is part of the “Easter-Spring Dress” sew-a-long because of the obvious…it is perfect for spring and was specifically made to wear on Palm Sunday. This is part one of two dresses for this sew-a-long. Only because the design was so simple was I able to plan for two new garments for Easter time! Although it is simple, the design is first class. The instructions were very complicated for what one would think looking at the cover envelope picture and design lines of the dress. The instructions were meant for a fully lined dress with fancy tailoring and made of a flowing woven as suggested by pattern back. My own dress was much simplified, mostly due to the fact it’s merely made from a single layer of a drapey knit with no seam edge finishing. 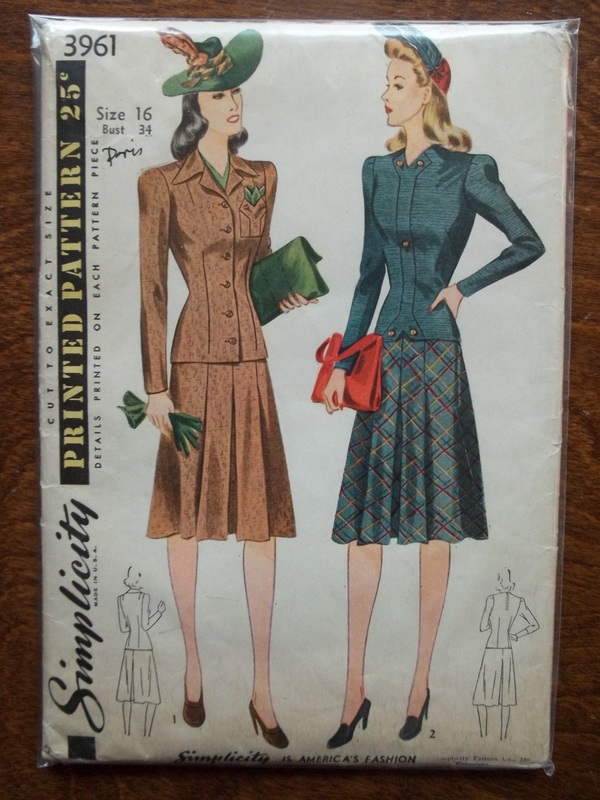 I’ll admit I am not used to working with true vintage Vogue patterns – maybe such thorough instructions, fine designs, and nice details are the norm of all their offerings, whatever era they come from. 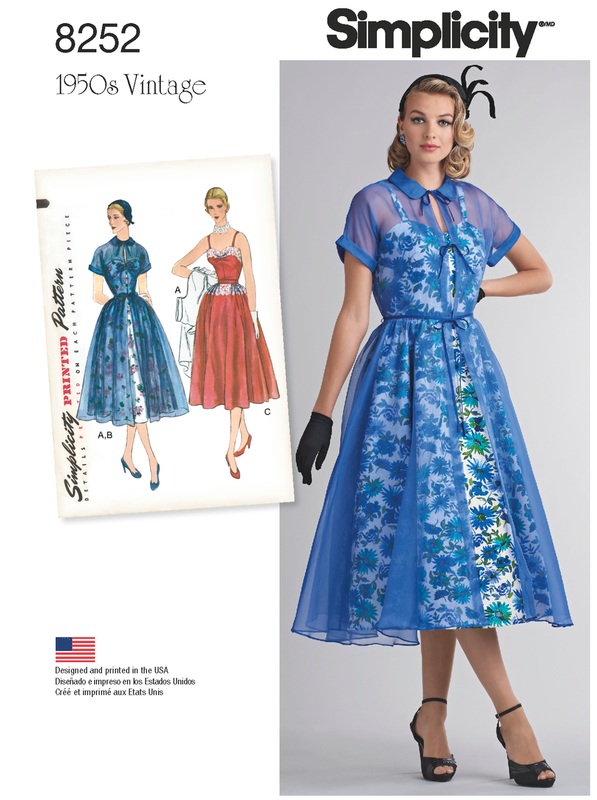 I do generally love the modern “Vintage Vogue” line of patterns for those same features. 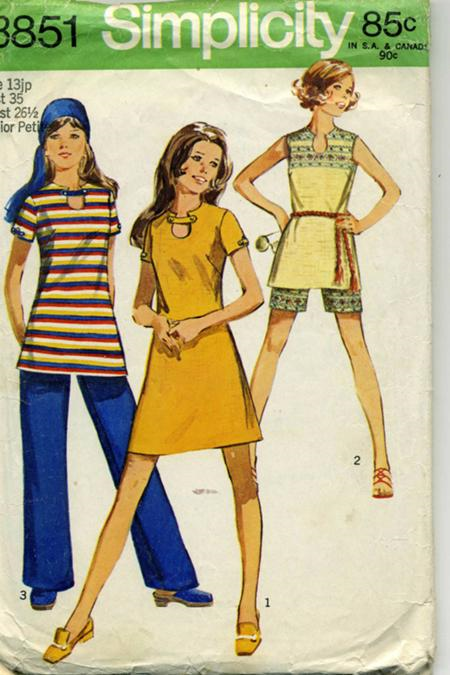 Maybe, I just have a new ‘need’ to find and make some more old Vogue patterns! The rayon knit has a shifty, heavy drape so the wide bateau neckline, which is the highlight of the dress, needed to be interfaced. I used a stiff, sew-in mid weight interfacing attached to just the one-piece, self-facing which gets turned inside the neckline. However, the rest of the dress was left without anything to stabilize the seams and this seems to work out fine, but I still am not sure. Was I supposed to add in seam tape to the long French bust darts, at least – or maybe to the side seams, too? I didn’t. The dress seems slightly generous in fit the way and I supposed it was because of the nature fabric but I don’t mind – it only adds to the comfort of wearing it. However, I do have a very strong suspicion that this dress will “grow” after every wash, the fabric getting slightly bigger and out of shape. That’s why they added in spandex to the rayon, to prevent this, so I shouldn’t be suspect. So…for now I’m happy with it the way it is and if it does “grow” on me the more I wash and wear it, I suppose I’ll either take it in or/and add on the seam tape then. Only minor adjustment were made – to lengthen the dress hem and sleeve length by one inch. I like this length of the dress (and it has a 2 inch hem) but the sleeves took about a 4 ½ inch hem to get them to the length they are and they are still a tad long. 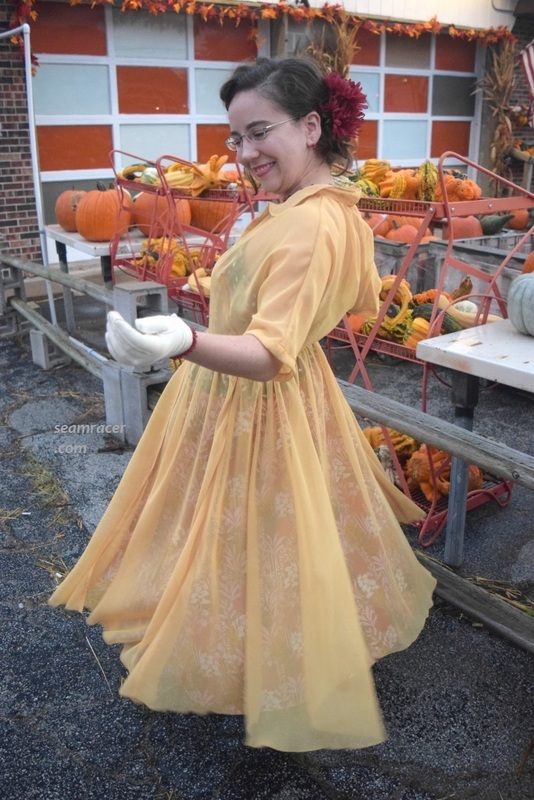 Other than the fact that the sleeve armpit seam dips rather low for my preference and I raised by just under and inch, this dress was straightforward to make. I do have to laugh at myself that I sew with a non-floral fabric and have it in my mind that it is inspired by nature. It figures! Oh well – after spending the week before at home being sick, this outfit gave me the prod I needed to get out and enjoy my favorite part of the outdoors. Inspiration is everywhere. For more pictures of my ‘frolicking’ through nature in this outfit check out my Instagram! 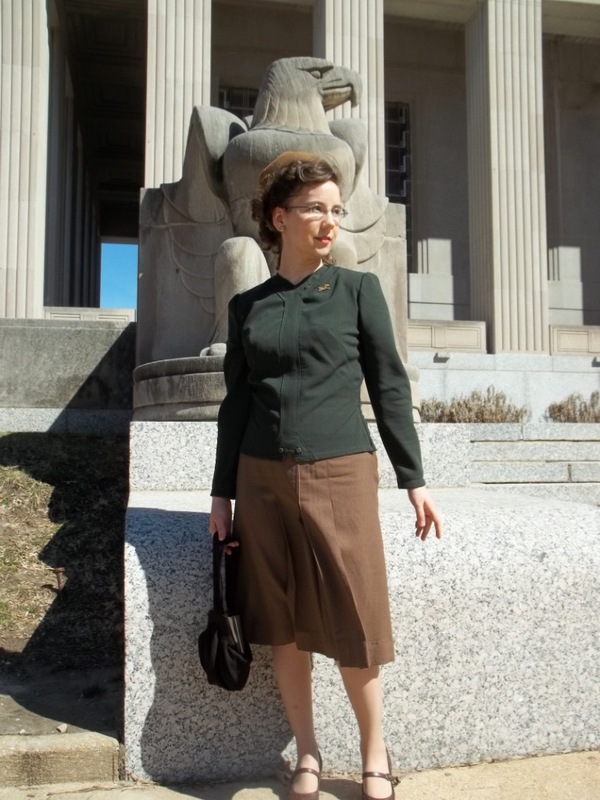 As the perfect example of the modern opportunity to mash things up as one desires, I used a recent holiday – St. Patrick’s day on March 17 – as an excuse to wear a military-green 1941 vintage suit blouse I recently made to complete a set. There was a famous WWII B-17 G bomber called “Bit O’ Lace”…well, here I’m wearing a little bit o’ green, and a whole lot of cheer. 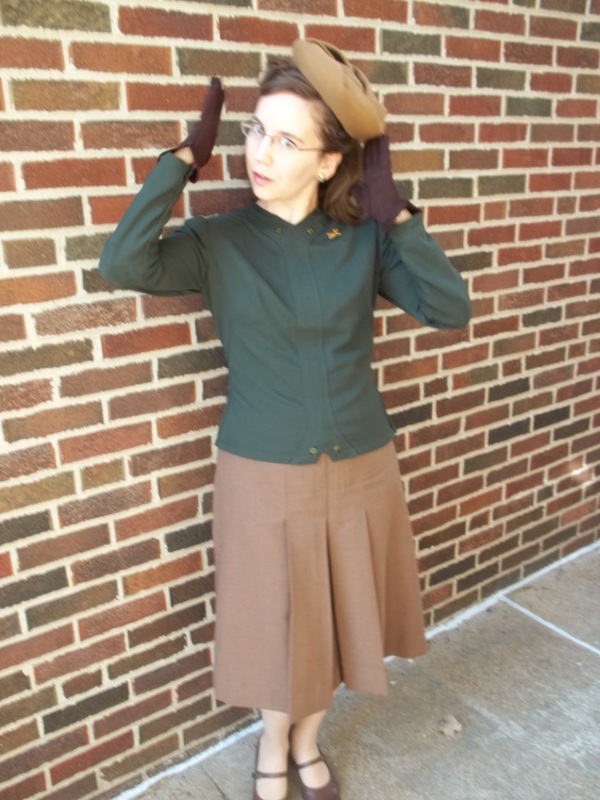 This is another post part of my “Agent Carter” sew along. A good part of the decade of the 1940’s was consumed by the effects, and after-effects, of World War II. It comes as a simple matter of fact that a good part of the fashions of the 40’s also took on a bit of a war-time influenced appearance. I’m supposing adopting a military-influenced style was part patriotic, part necessity for the 40’s, but what’s to explain the prevailing popularity of combat style fashion even ’til today?! Whatever the reason, those who have served, or are serving, to protect the country they call home should be flattered by the way that a military fashion style is persistently trendy. Imitation is the best form of flattery, so the saying goes. 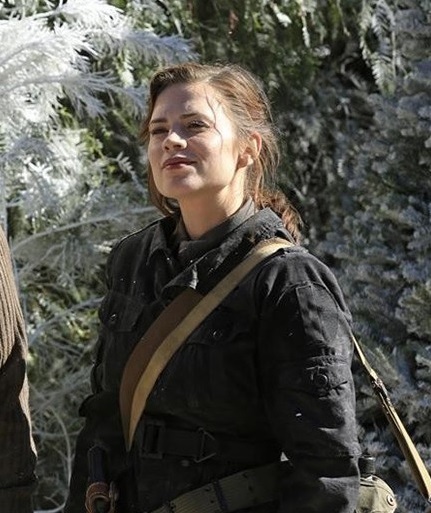 My military 1941 blouse is an ironic mix of the bitter and the sweet, from a sewing point of view and from a historical tribute point of view. From a sewer’s viewpoint, all quality materials went into this suit blouse, wool and rayon, with vintage notions and silk as the lining, making it like butter on the skin – all the very sweet part. I also thought that this blouse’s high quality would come easier than if making a full out jacket…but, no, it didn’t. This is the first half of the bitter part to my blouse. I finally assumed that the styling would be incredibly slimming and easy to wear. Not that it doesn’t fit me very well, because it does, indeed! The blouse is just hard for me to feel like it, well, “suits” me (pun intended) and compliments my figure as much as I expected. However, making one’s own clothes does have the advantage of trying new styles, and I have indeed worn other styles much stranger (such as this one or even this one). So, my final happy resolution is that as long as I fits and feels good to wear, what do I really have to crab about? I’ll just wear it and be happy, and let the Irish “cheery and positive” part of me shine! 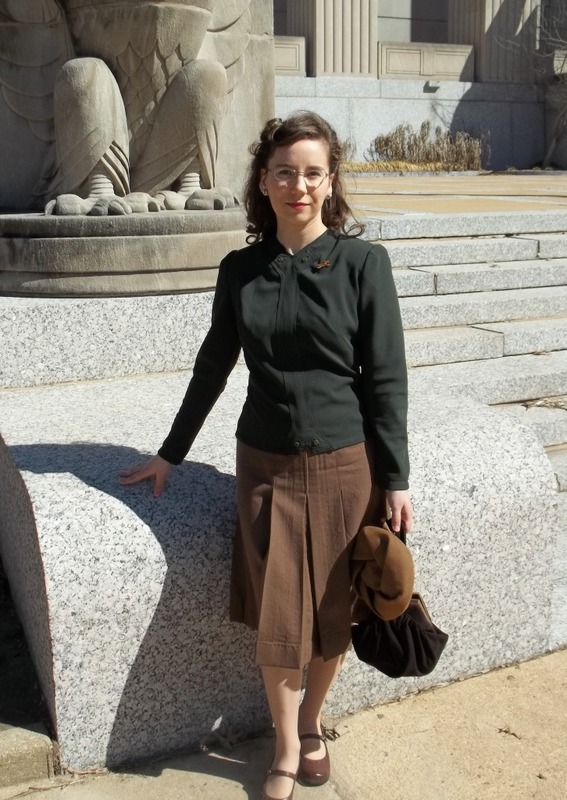 Taking the historical tribute point of view, my military 1941 blouse is a quiet tribute to the bravery of “Our Soldier Dead”, as is said above the building in my background. 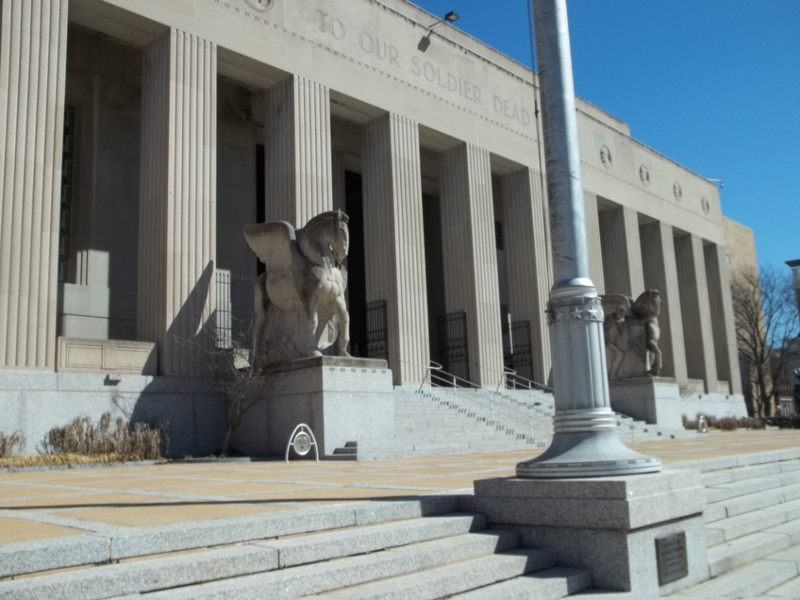 On a beautifully warm morning, my family and I visited our town’s Soldiers’ Memorial building, an Art Deco masterpiece built in 1938, and soaked up knowledge in the inner museum. It is amazing to see all the bravery of our country’s soldiers remembered in one spot from 1860’s on to today. Furthermore, my dad and my hubby are both entirely sucked in with interest to a shared gift of the book on tape of the story “Unbroken”. 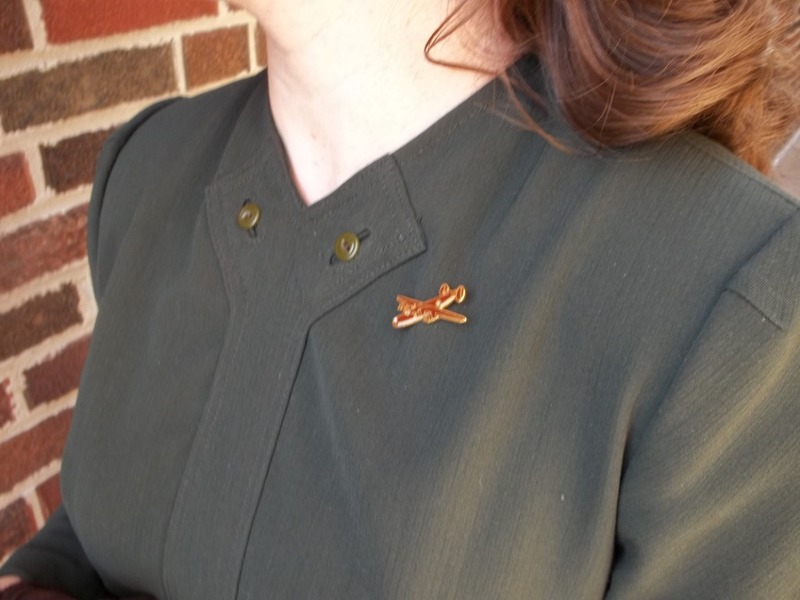 The great “Liberator” B-24 bomber planes were key to the story of Louis Zamperini, hero of “Unbroken”, and so I wore an enameled pin of a B-24, a gift from my dad years ago, on my blouse as a quiet military/WWII remembrance. It is sweet but sad at the same time to recount and remember such history. FABRIC: My suit blouse fabric that you see is a fine half wool, half viscose rayon blend, in a deeply dark forest green color. It is a wonderfully smooth (meaning non-itchy), textured twill with a medium weight, a fluid drape, and a slight stretch. As the lining, I chose a bright apple green 100% silk, “China silk” habotai. NOTIONS: All my notions (except for thread, zippers, and shoulder pads) are authentically vintage. 100% rayon hem and bias tapes were given to me by my friends at a retro shop. Thank you for that kindness! The buttons are also vintage but from my inherited stash of notions from hubby’s Grandmother. THE INSIDES: Very nice indeed! The side seams and the sleeve seams are done in French finishing, while the sleeve and blouse hems and center front are covered in vintage dark green hem tape. The inner neckline and armhole seams are covered up by vintage bright green bias tape. TOTAL COST: The wool/rayon twill was bought at Hancock Fabrics as an end of season clearance at only $2.25 a yard. I bought two yards but actually used less than that (only 1 1/3 yd. ), so the wool/rayon was less than $4.50. The silk was ordered from Fashion Fabrics Club at about $22 for two yards. I bought the thread and zippers from Hancock, to add on about $4.00. So, my total cost is probably more or less $30. 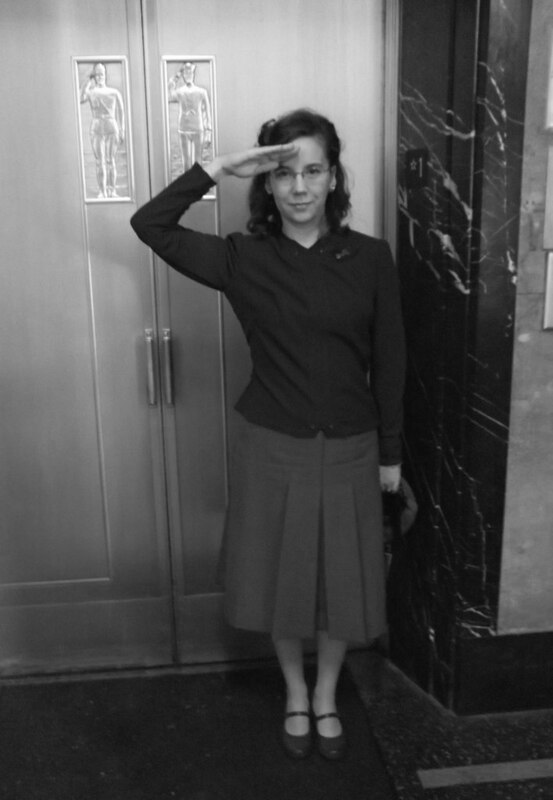 All my preaching and facts aside the construction of my 1941 suit blouse was really easy, just time consuming. The skirt of the suit has already been made and posted about (it can be seen here). That bottom half was easy to make and fit well, so I felt assured of the fit to the top half and cut it out as is with no changes. The sizes of this pattern are a size bigger than I technically need for my measurements, but I think this pattern runs a tad small. There were only three adaptations I did make. The first was to cut the sleeves out on the bias, for a non-confining fit which moves with my moves, rather than on the straight grain as instructed. The second small adjustment was to snip off only 1/4 inch, starting from the underarm down to nothing at the waist, from the sides of the bodice front, to decrease the bust size to fit me better. Thirdly, I eliminated the center fifth button/buttonhole in the middle of the front band. My blouse seemed like some tiny thread monster with a giant appetite. For such a little project, I went through so much thread! My total spool count was just about three, and I still wonder where it all went, or if it weighs the blouse down. 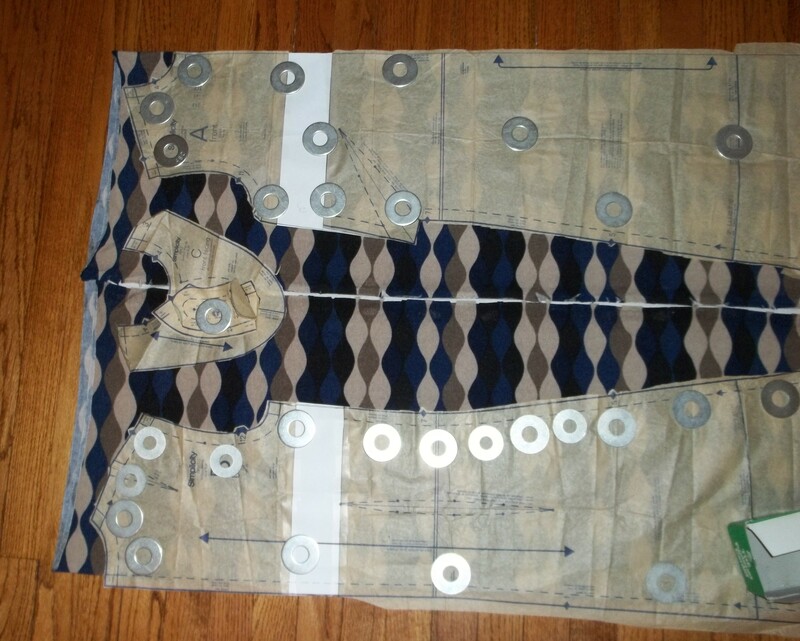 Using up a lot of thread makes sense, as I had to baste the silk to all the pieces individually, make old-fashioned “windowpane” button holes, sew around seam allowances, and top-stitch the front piece in two double stitched rows. Let me briefly highlight some of the blouse’s interesting features. 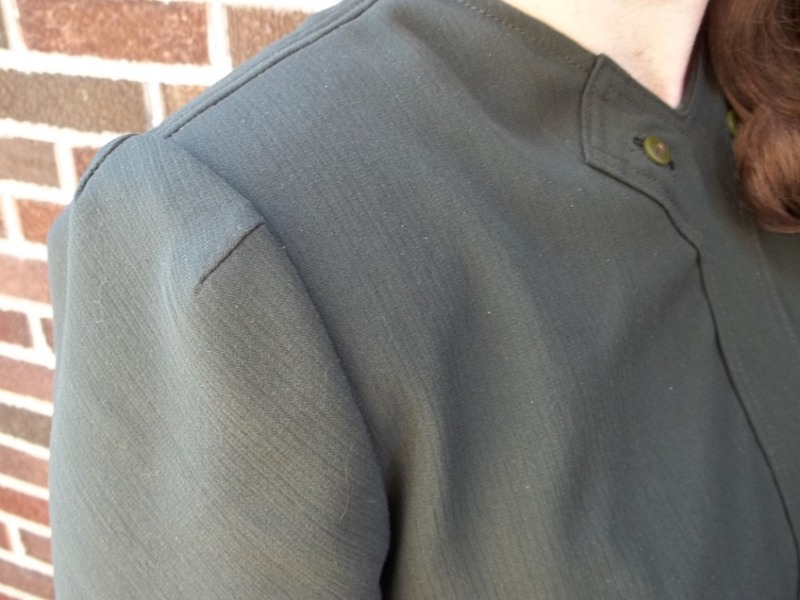 There are the traditional early to mid-1940’s style sleeve top darts, to create a very squared off, wide shoulder look, which I filled in with shoulder pads. 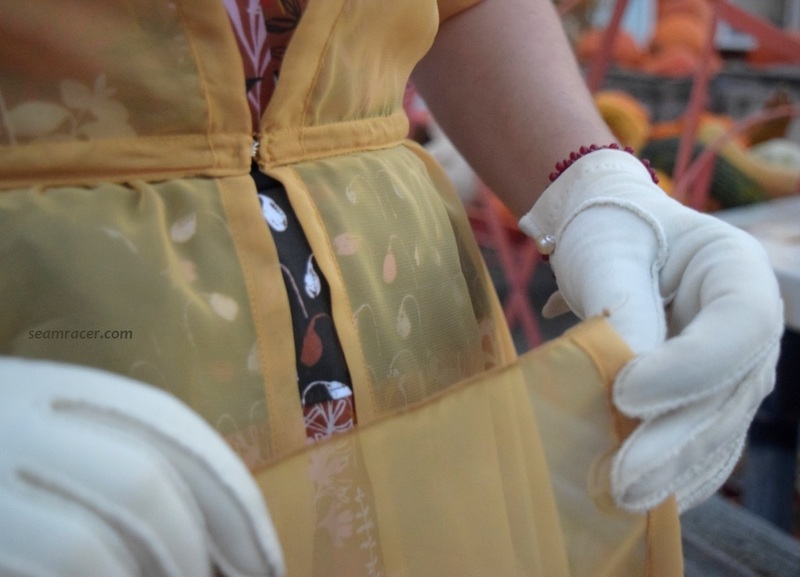 My long sleeves are very tapered and skinny at the wrist, having a trio of elbow darts, with a snap wrist closure, very similar to the sleeves of my red 1946 dress. The bust darts are long French darts, which go across the bias of the fabric and start at the waistline from the side seams. I have not yet seen French darts on a 40’s garment before (I see most of this feature on clothes between the 50’s to 70’s), but, nevertheless, it does always create amazing shaping in a very comfy manner. 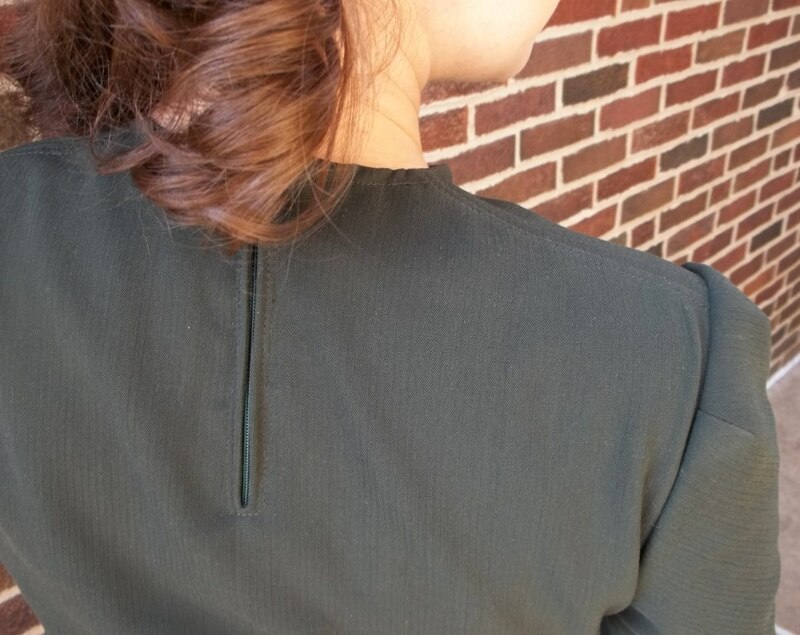 A back neck zipper aids in slipping the suit blouse over one’s head, since there is a rather high V-neckline to the front. My blouse has a side zipper, too, which incredibly amazes me. 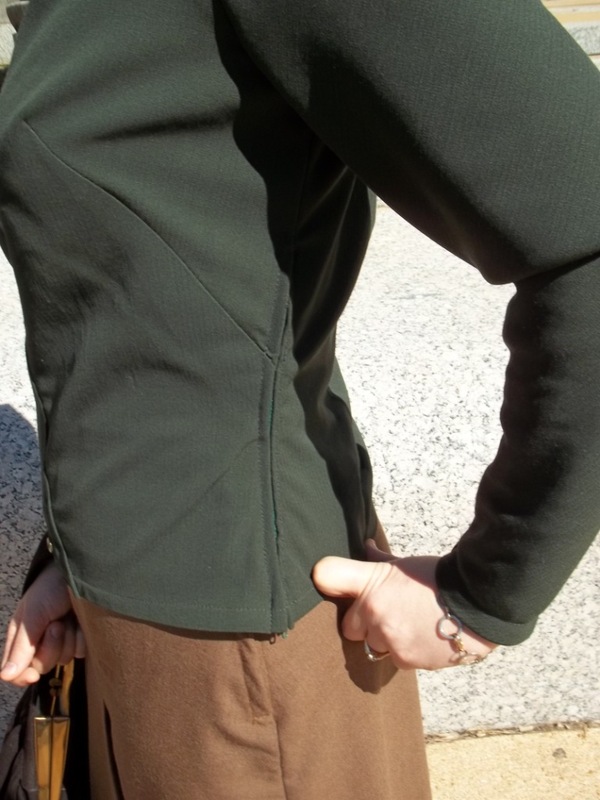 What’s so amazing about a side zipper, you might wonder? Well, the side seams have an incredible curve, with the height of the dip at the waistline, where the French darts come in. If you’ve never sewn a closure into a curve…believe me you don’t want to unless you would like a big anvil to fall on you. If you have done one, you’ll understand with me that installing a zipper into a curved seam is fully possible, just one big frustration. 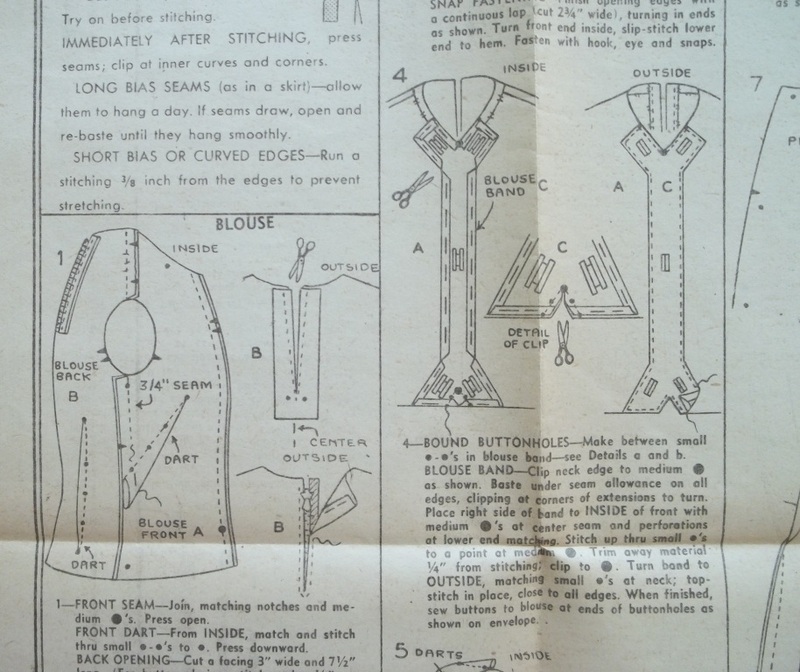 I have done zippers like this before, but never with a curve so steep, and – for the first time in my sewing – I actually got quite foul, angry, and worked up into an exasperated sweat. In disbelief, I read the pattern’s instructions and stared at the instructions, but yes…they said to insert a “slide fastener”, meaning a zipper, or snap tape. As things turned out, I had to try four whole times both sewing down and unpicking to finally come out with a decently perfect zipper installation. I was bull-headed enough to stick to getting it right, and boy did I learn from this experience! The back neck zipper was no problem at all in comparison. 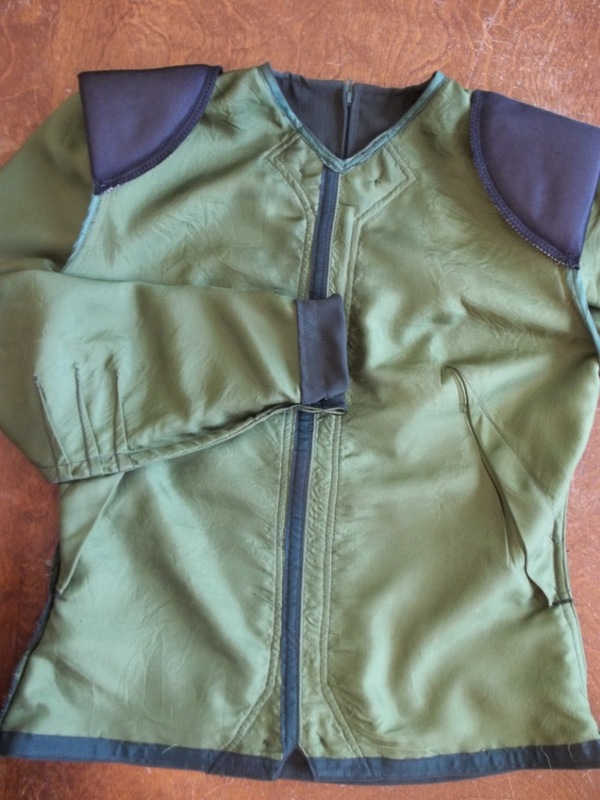 The instructions said to draft your own strip of facing, 3 1/2 inches by 7 inches, and sew this on, snip the slit, and turn inside like any other faced opening, then add in the zipper. The front panel band is THE piece that truly makes the suit jacket, I think. After all, making that piece took up about one-third of the total time spent on my suit blouse as a whole. The big irony of the front is all that time and effort goes into something purely decorative – even the windowpane buttonholes, darn it! I like a challenge and test my skills, as well as constantly do things a bit differently, so I feel the extra effort was entirely worth it, in the end, especially since the panel band is on display in the front. I do enjoy making this style of buttonhole, and, as this is the second time using them on a project, I am even happier with how they turned out than the first time (which can be seen here). 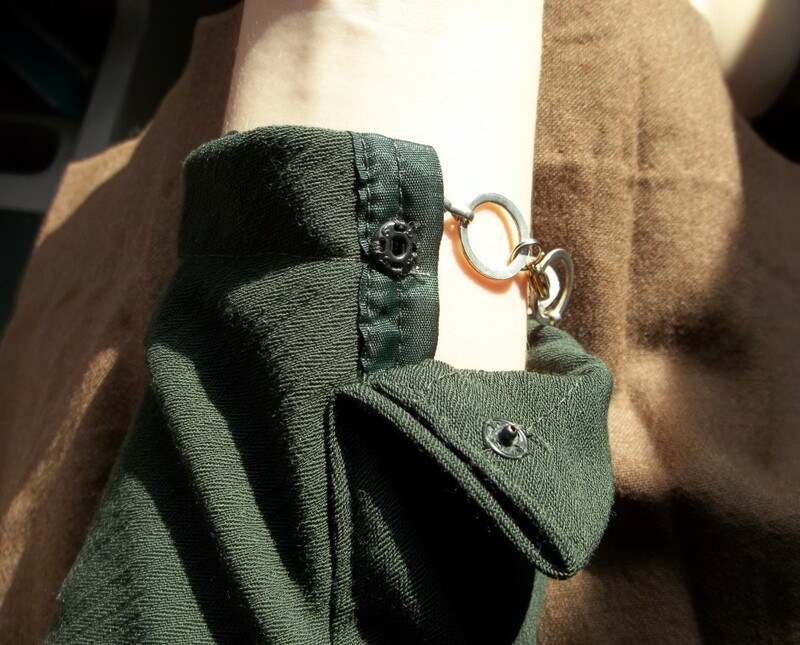 An interesting unexpected trick is involved in lapping on the front panel band onto the front of the suit blouse. I was directed by the instructions to first completely finish the blouse (hem and all), and next work on the band making the button holes then turning under the seam allowance (1/2 inch), keeping a straight un-notched bottom. The band gets sewn to the inside of the top, wrong side to right side, just stitching a small V around the center bottom (see picture). You snip out the fabric from under/in between the triangle stitched at the bottom, so you can turn the front band to the right side. This was a hard step because that spot is about the bulkiest spot on the blouse, as the center front seam ends there as well as the hem being turned up, too. I was afraid the pressure I had to put into snipping through all those layers would get carried away, and snip too far to ruin my blouse just as it was almost done. It worked out fine, as you can see, and with a little “Fray-Check” liquid on the inside points, the front panel band was lapped onto the front and top-stitched down in double rows (one on the very edge and one 1/4 away from edge). The lack of neck facing was a sort of relief. It’s nice to have things done differently…it keeps one interest piqued. Besides, I really didn’t feel like doing the hand sewing that would have been necessary to keep the facing down. I used my vintage rayon bias tape, which matched perfectly with the silk lining, as a simple, skinny, bias facing. We had the hardest time ever picturing the colors true to reality. The sun was bright and overwhelmed the exposure. 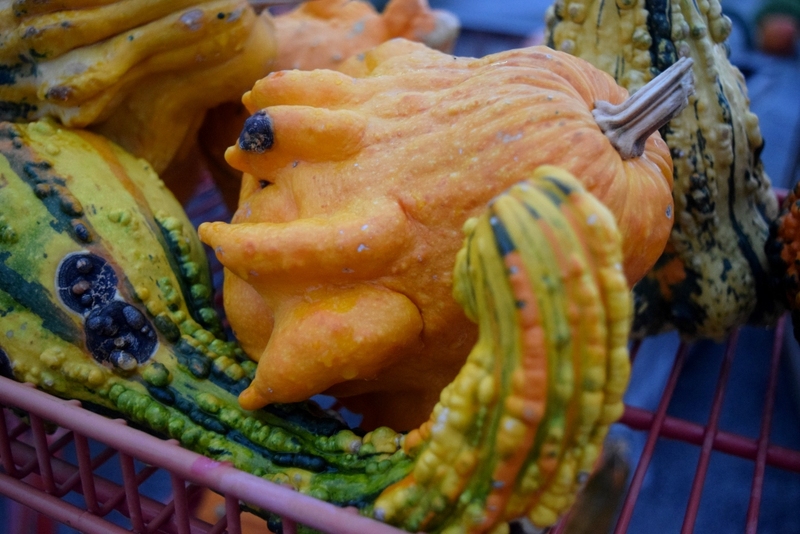 Cloudy days are almost always the best time to get the real colors to show up in our pictures with our camera. The best explanation I can give for the color of my wool blend twill is that it is the same color as my late 1930’s Kenmore Rotary sewing machine (see this picture). It is not grey! As for the true color of my silk lining just think of the color of some “green apple” flavored hard candy, and you should see the shade close to correctly. My hat is actually a mid-1940’s era piece. I think the brown tone matches well enough, and the styling is close enough to work. I love the interesting design of the fold-over pleats! 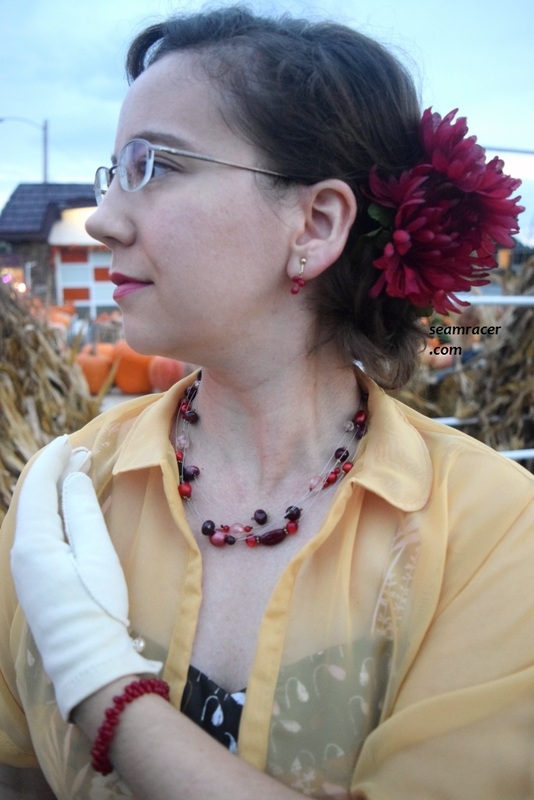 Do you possess any military themed vintage notions, jewelry, or fabric? Have you seen any of those “buttons looking like planes or studs that look like bullets” which I have read about in Chapter 4, “Independence and Limitations” of the book “Forties Fashion” by Jonathan Walford . Make your own tough-and-feminine mix and share it here with me! I have a weak spot for funky, fun, and bold prints. Perhaps it’s the inner wild child that wants to have more fun with my fashion than I ever had the nerve for in my younger years. Another weak spot in my love for fabric goes to cozy, easy-care sweater knits. (I’ve used a similar fabric for this project.) 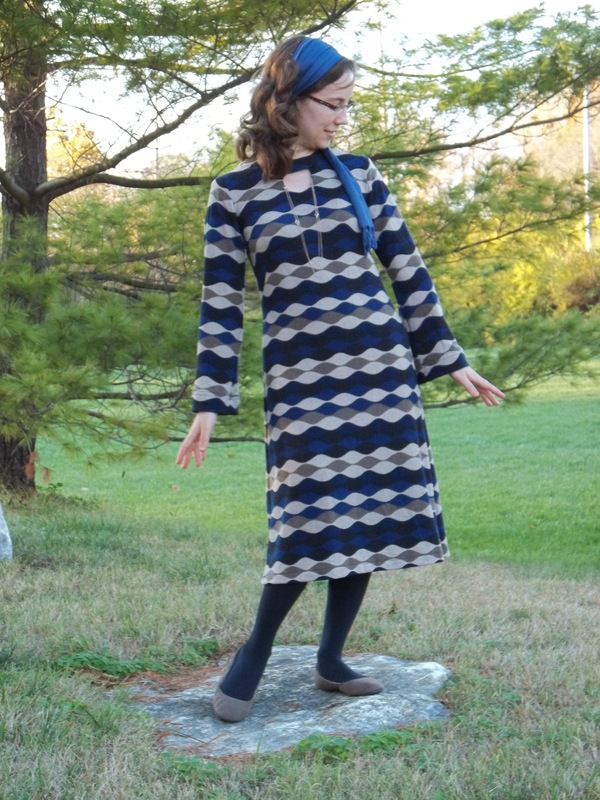 This post is about a dress that combines those two happy “weak spots” in my fabric taste – a dress that is a good example of a fashion at the outset of a new decade. When you sew your own garments, it’s never a bad thing to have your clothes stand out from the crowd. With all my projects, I always try to make sure they are made with great care, have special details, are precisely for my own style, and tailored for the best personal fit. So, if my garments do stand out, and perhaps get a few compliments, that is necessarily a good thing – especially when I can say, “Thanks, I made it myself!” No matter what your own sewing qualities are, to have made some thing you are wearing deserves no small amount of pride. The sewing craft is an amazing combination of art and utility and talent. This dress makes me happy and proud on account of successfully resizing it from a junior’s size and making it with the instructions missing. I can’t help but twisting up that famous phrase from the 1948 Treasure of the Sierra Madre movie, “Instructions? I don’t need no stinking instructions!” (See original movie clip here.) Having no instructions actually made the construction fun and more a matter of sewing knowledge, by relying 100% on figuring out what goes together when and thinking backwards. Also, the knowledge learned from figuring out how to adapt the proportions of a junior’s pattern to my sizing has come in handy since then. Now even more patterns are open to being a possibility for me to tackle. The pattern had just a few basic pieces to it – a front, a back, a neckline facing, and the neckline tab. Thus it was easy for me to fit tissue pieces of the front and the back around myself. I figured out that the bust line, the waist line, and the hip line were all consistently 2 inches higher than my actual bust, waist, and hip lines. 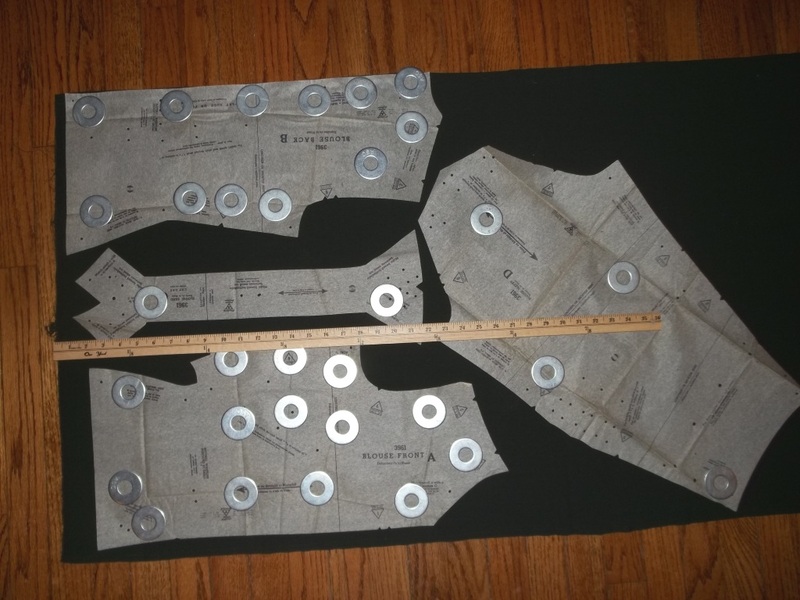 To remedy this, I started by measuring the length along the side seam between the bust line and the top of the underarm seam and marking the center of that measurement. I then marked that measurement as a horizontal line all the way around the dress – front and back, going across between the shoulders and the middle of my chest. The pattern was slashed apart at that line and I taped in a long strip of paper 2 inches wide to re-align the bust, waist, and hip measurements all at once…easy as pie! Figuring out the facing was easy after doing so many neck facings on what feels like a billion garments in my lifetime of sewing. It was simply right sides together, then sewing around the keyhole neckline opening on the chest, clipping curves and excess fabric, and turning right sides out. I did sew in seam tape onto the entire neckline, except for the keyhole circle, to keep the neck in shape and support the rest of the stretchy, heavy dress. The tab closure at the neckline is sewn on top the dress across from one top corner of the keyhole over to the other, so it’s o.k. to have the seam tape end there. The tab’s facing is a heavy weight black cotton scrap to make sure that it stays stable and doesn’t stretch either. Having the inner keyhole stretchy provides just enough give for me to slip the dress on over my head, but once on me, with the tab closed, the neckline it entirely stable. Heavy, black, 1 inch snaps close up the neckline keyhole tab. 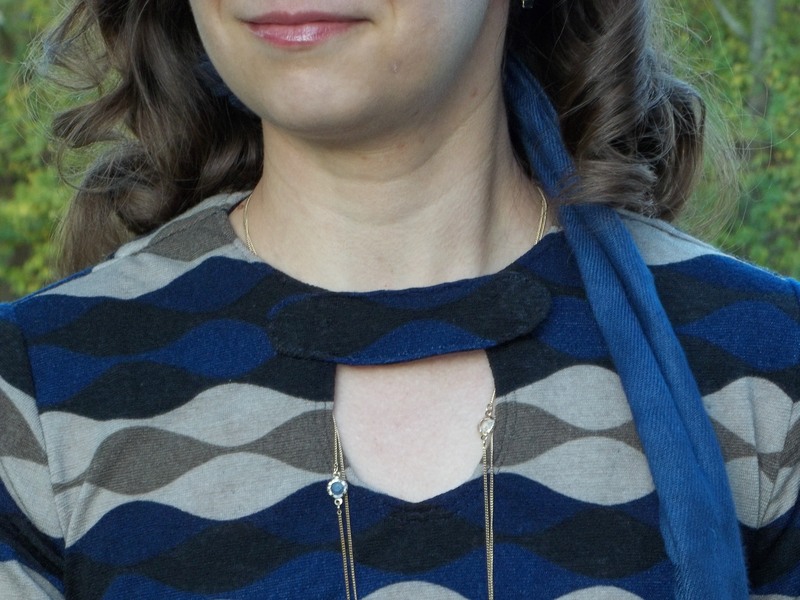 I spent the time to do some fine and detailed hand stitching to invisibly tack down the neck facing, just loosely catching the inside chains of the knit. Long sleeves were added as the pattern was intended as a summer garment. 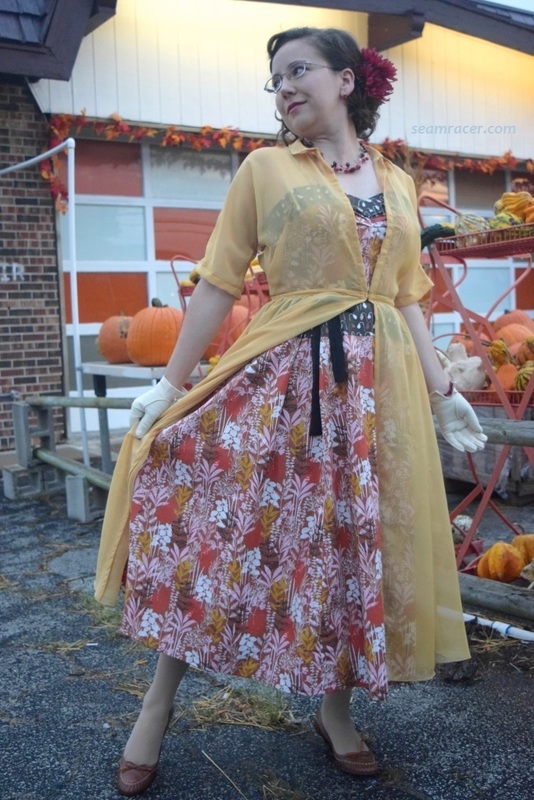 I used an old favorite standby modern pattern which has bell sleeves to go with the era appropriate funky look. I used these sleeves before to make this 20’s style tunic, and I love how they can work with a knit or a woven. It’s always nice to use a perfect fitting piece from a pattern you’ve used before…it takes some of the guess work out of sewing. 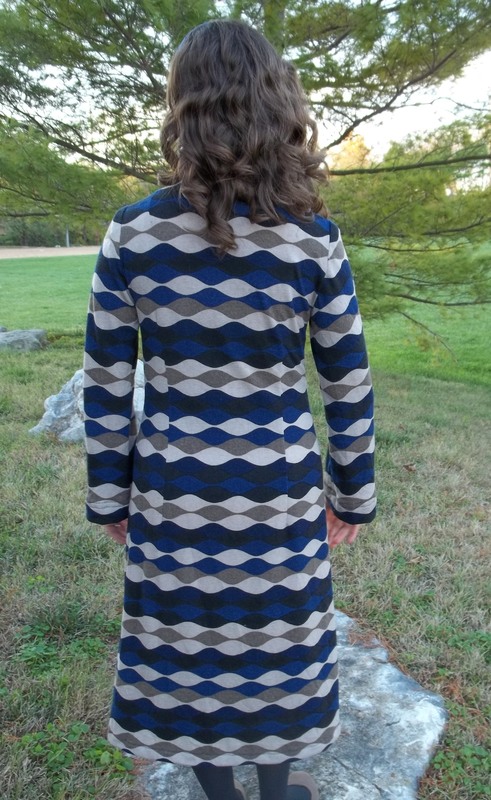 I had fun achieving precise stripe matching along the sides of the dress and across the sleeves. 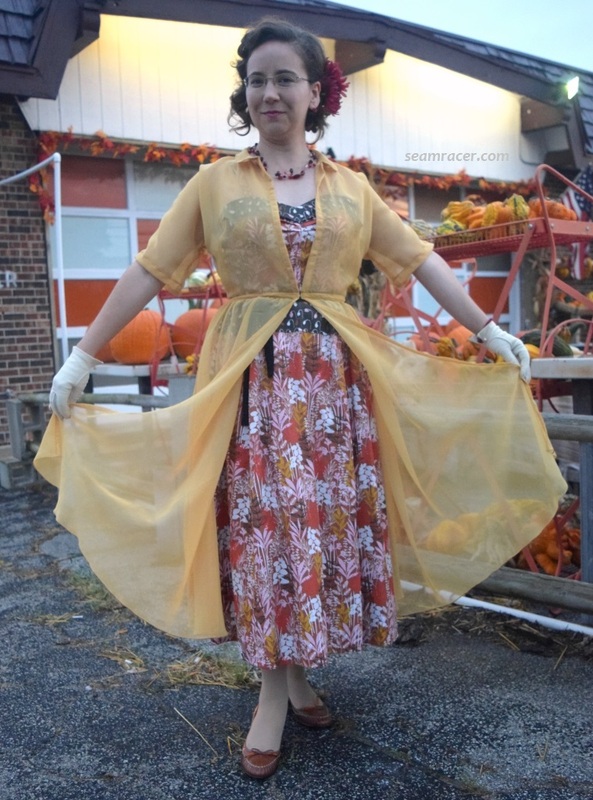 See my full length pictures – how cool does that look when I have my sleeves down?! Small, interesting details (except for the long French-style bust darts) are lacking with this dress to make the most of aligning the fabric’s squiggle stripes. So many RTW (ready to wear) garments have either a half-hearted sort of attempt at remotely matching stripes or they brazenly slap the pieces together with no intent at matching. I only notice more expensive garments to possess good stripe matching…but for the personal seamstress, it can be fun and easy with no extra cost and very high satisfaction! Matching any sort of pattern matching/aligning costs clothing makers and manufacturers so much extra money, it’s ridiculous – the sewers need to have better skills, more fabric gets wasted, and more time is taken…all of which costs money in the long run. So – you get what you pay for with RTW…unless you’re lucky enough to know how to do it yourself. That is ultimate and best trump card. In the above picture, you can see so much of what I did for my dress: the layout to make the most of my fabric, the way I matched the stripes, how I resized the pattern, and washers that I use for pattern weights. Take note that the pattern called for a center back seam in order to insert a zipper, but as I was using a knit, I merely cut out the back on the fold minus the seam allowance. This might sound funny, but this dress took me so long to get to posting about it (a year and a few months) because I wear it so darn much. My dress gets worn on such a regular basis that by the time I am posting about the dress it literally is starting to look worn. All I need to do to renew it is run one of those fabric shavers across it to remove the lint pills. But, not to digress, I think I am so used to reaching for it to put it on, and feeling incredibly happy and comfy wearing it, that the dress does not occur to me as new, and therefore worthy of a write-up. I also sense that, as the dress gets worn so much out and about, it gets its own live broadcasted promotion on myself, and that’s better than anything which can be put into words. 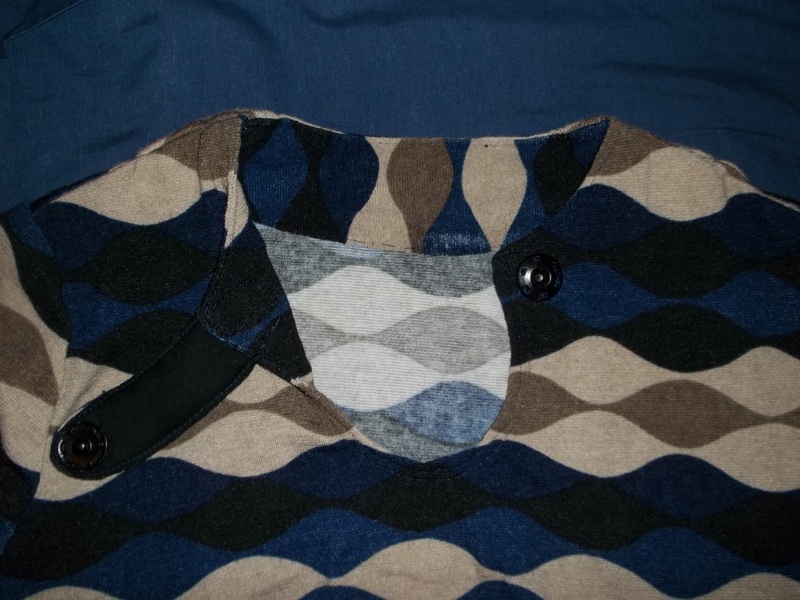 FABRIC: a lofty, brushed 100% polyester sweater knit in a royal blue, black, and tan squiggle/wavy striped design. The squiggle design is printed on the fabric, leaving the inside wrong side as a solid neutral dark cream color. I also used a scrap of heavy black cotton for the facing of the neck tab. NOTIONS: I didn’t need to buy any notions – they were all on hand, and I only needed snaps and thread. 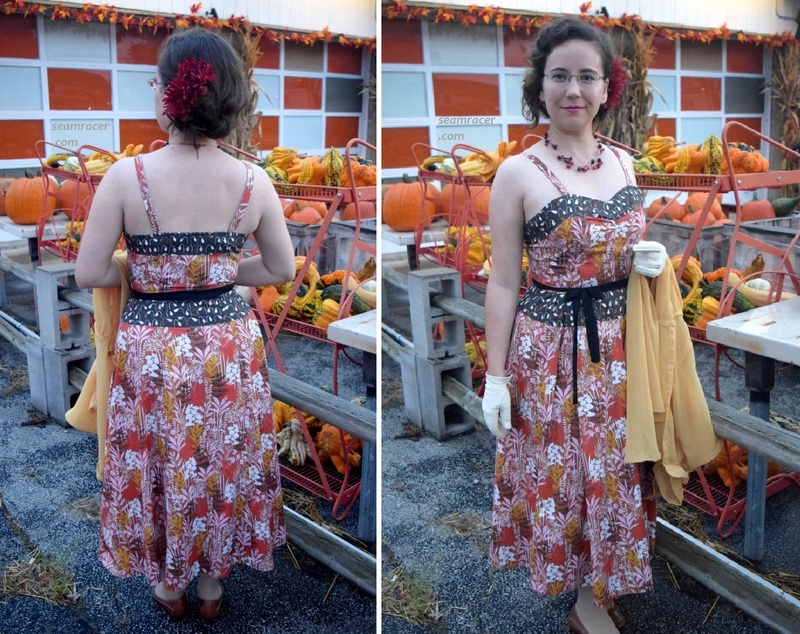 TIME TO COMPLETE: This dress took me only about 6 hours to make, and was finished on November 5, 2013. THE INSIDES: This knit doesn’t ravel. To keep the dress springy and stretchy, the dress and its edges are merely zig-zag stitched together. TOTAL COST: I really don’t remember any more, but I know I didn’t spend any more than $15 or $20.